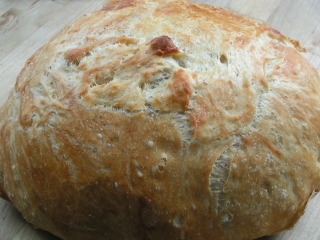 You know winter's here when Megan's blogging about No Knead Bread. Sounds like Cook's Illustrated fooled around with it and found that adding beer and vinegar improved its flavor. I kind of like its flavor as is but am curious. See my experiences with No Knead Bread here. I'm also curious about making two smaller loaves out of the big loaf as I have a new Le Creuset casserole that I got off Craig's List for a steal from a guy closing his cooking store. Could I divide it right before baking and then immediately bake a second loaf (after the first is finished)?